Food represents a big part of experiencing a culture. When you travel, you are literally digesting the destination with every bite of the local cuisine. But if you have a big sweet tooth like me, savory dishes aren't the only thing you sample on a trip. It might sound strange, but I try to seek out local candy stores whenever I visit a new place. It gives me an unexpected glimpse into the society through the lens of sweets. 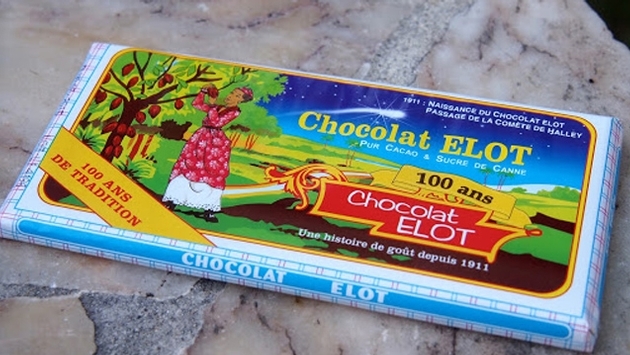 A lot of places all over the world claim superior chocolate treats and I've tried quite a few of them but my favorite is the little known Chocolat Elot found only in Martinique. The Elot company was founded in 1911 and its high quality chocolate bars in milk or dark chocolate are a sweet standby all over the island. What makes the chocolate stand out is the Martinican sugar that gives it a slightly grainy texture and a rich and intense sweetness that differs from any other chocolate I've ever tasted. You'll remember your first bite of Chocolat Elot the way you'll remember your first visit to Martinique. Cocada is actually a very popular candy throughout Latin America but in Brazil, especially the Northeastern region where cocada originated, it is a part of the gastronomic landscape. The candy pops up everywhere, from fine restaurants to street stands. Rich and ultra-sweet, this coconut candy comes in lots of variations including simple branca or white coconut, maracuja or passion fruit and abacaxi or pineapple. But the ultimate cocada in my opinion and judging from its demand and cultural prevalence, most Brazilians will agree that cocada preta, or dark cocada, caramelized and made with the local, unrefined cane sugar rapadura, is the best. The burnt sugar taste and flavor complexity from the rapadura make cocada preta an unforgettable confection. I'm not talking about the hard, brittle, candy passed off as English toffee by most Americans and a main feature of the Heath bar. I'm referring to traditional English toffee, cooked in slabs and broken into hard, semi-chewy pieces with a hammer. Classic English toffee is never covered in chocolate or nuts and it bursts with the rich flavor of molasses. In fact, it's said that the name toffee comes from a Caribbean rum tafia, that was distilled from molasses. Most American toffee is made from white sugar and contains none of the flavor or texture of English toffee. In London, you can buy toffee from vending machines, department stores and street markets. The Thornton's brand is my particular favorite and I have been known to take quick trips to London just to hoard it. The chewy, rich deliciousness of genuine English toffee is true joy. Forget searching out local tortas, it's the cajeta that you should try during your next trip to Mexico. A Mexican version of dulce de leche, cajeta is a creamy caramel-like confection that's silkier and richer than regular caramel. You can taste it in flans, cakes and cookies but I like it best in the unadorned candy form. Mexican candy stores are filled with countless cajeta variations and shapes, from discs to lollipops. The key to cajeta is that it's made from goat's milk , which supplies it with a nutty, milky flavor. One of my favorite travel memories is getting directions from locals in Antigua on where to buy sugar cake for the day. I was instructed to go to “Maggie Broomstick's” house, where she served up fresh batches of the dense candy. Rather than a commercial product, the grated coconut and sugar candy is usually homemade by a local woman. A stable for most children throughout the Caribbean, bags of this treat fills beach stalls, shop shelves and street stands all over the islands.